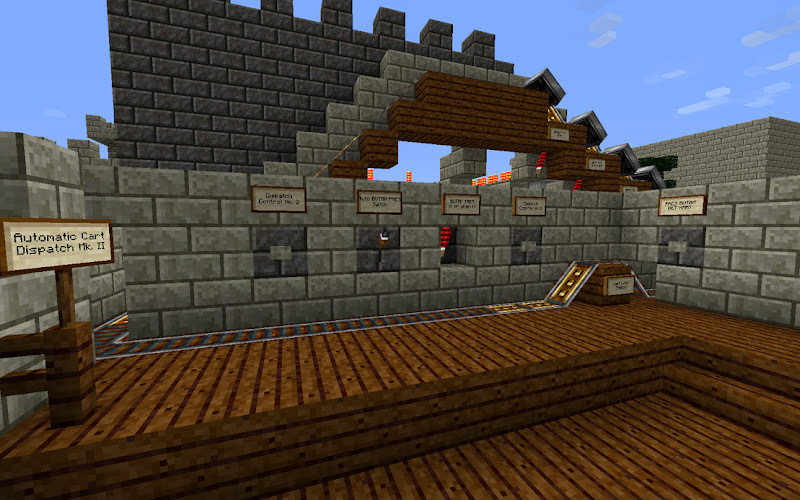 Minecraft Dark Ride Project: I AM THE DISPATCH MASTER - EXCELSIOR, YOU FATHEAD! 1. 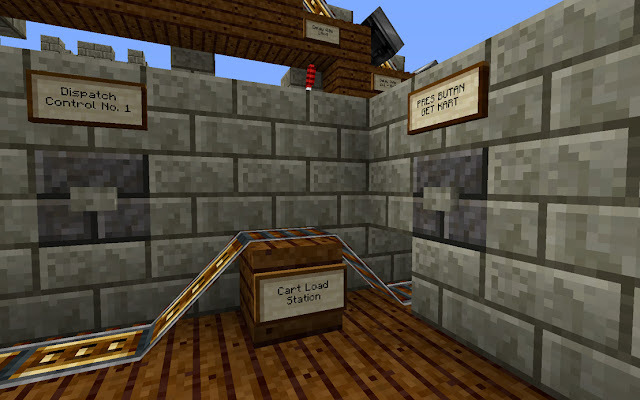 You can walk through the ride queue, press a button on the loading platform to summon a cart, hop in the cart, press another button to dispatch the cart, ride through the entire ride, arrive at the offload platform, then step off and walk through the exit while the cart is sent backstage to await another summons. 2. With three other carts. 3. In a nifty little dispenser thingo I made. Yeah, there's also a water stunt. 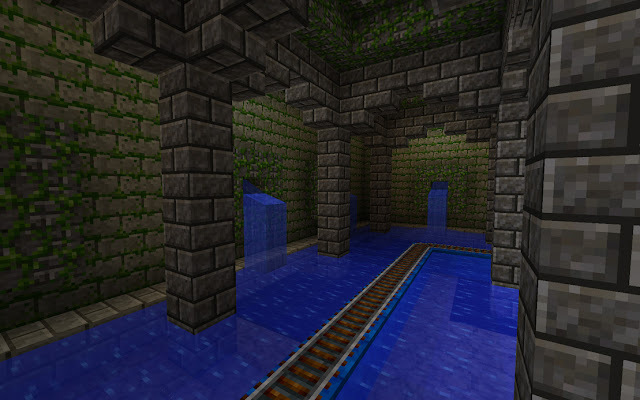 And a ride-thru viaduct, but I'll post on the scenery stuff later. Once it's actually finished. You know. 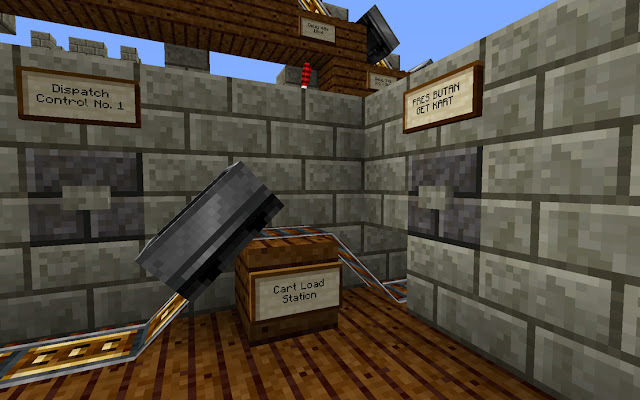 I'm most proud of the minecart dispenser. This was the first iteration I mocked up near the Jinx ride buildings to play around with timing, layout and visuals. The dispenser is a nice little cascading design. 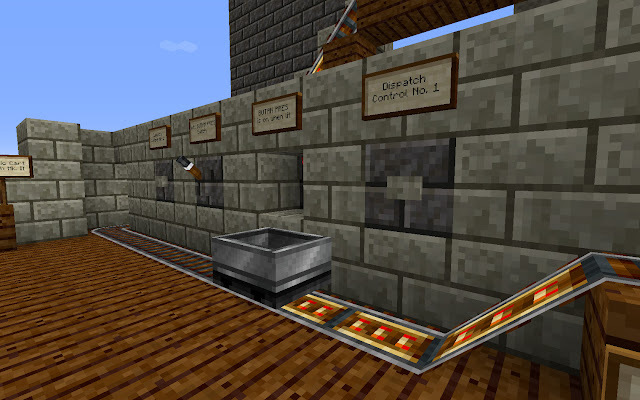 Minecarts are parked on downhill-angled booster track, which acts as a brake when left unpowered. 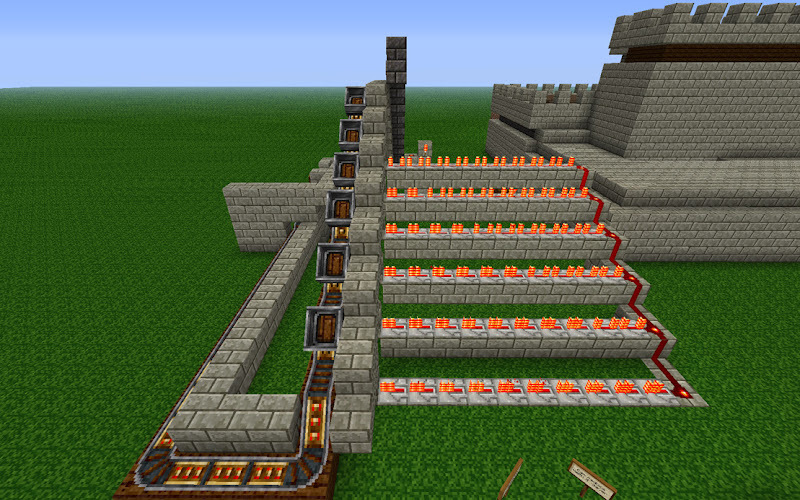 The circuitry sends a pulse to each section of booster track, releasing a cart which moves downhill. The pulse is timed so the lowest booster is activated first, allowing one cart to be sent to the loading platform while the others eventually drop in to fill the gaps. The cart on the loading platform will, once dispatched, end up on the booster at the very top. The trick was to make sure that each booster turns off just before the cart above comes down to it. After some fiddling around with the delay switches, I found that 0.6 seconds was enough time to do it. I've shown my work, but sign text is pretty rotten when viewed from a distance. 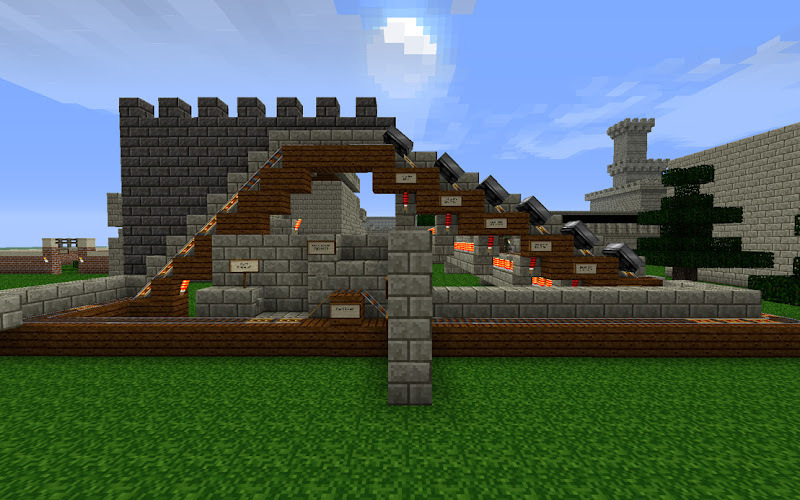 The second iteration grew a bit more complex, as I added automation to the design. 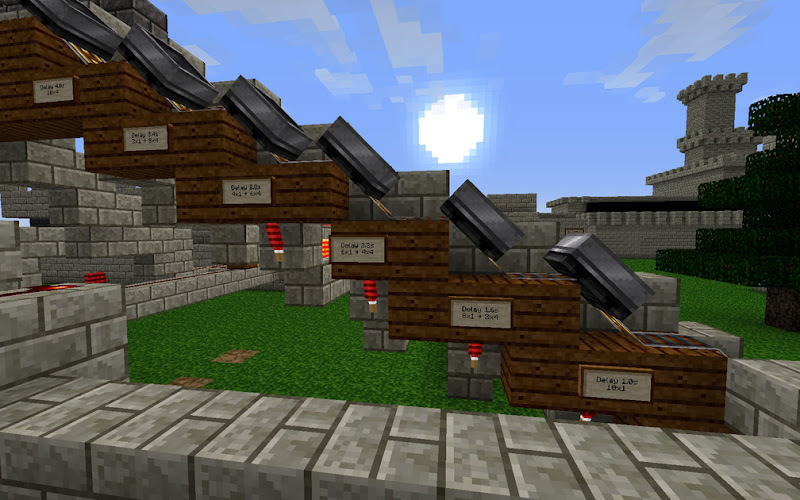 In doing so I built my first-ever logic gate in Minecraft. Naturally it needed to be honored. The control panel may look daunting with its impressive array of buttons, lever and signal light, but the process here is very simple. Step 3. MAK KART GO. The two dispatch buttons are another proof-of-concept. 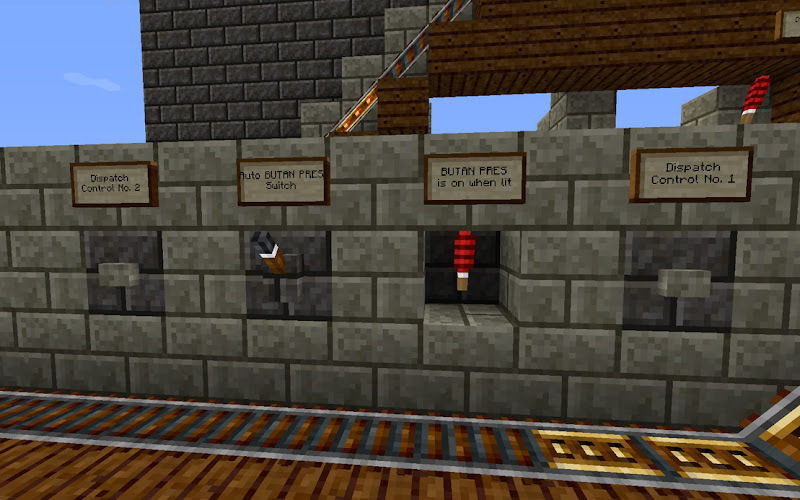 #1 is the self-dispatch button, located within reach of the minecart rider. 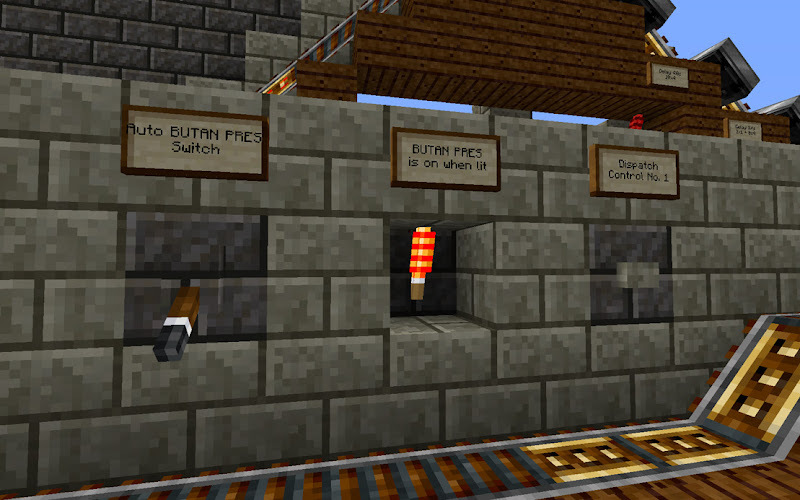 #2 is the operator dispatch button, for control freaks who want to play ride op in multiplayer or something. The automated BUTAN PRES feature eliminates Step 1 of that process for you. 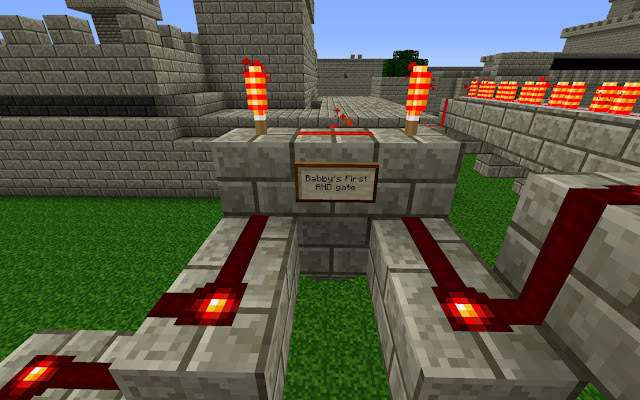 (This is the feature which required the AND gate.) 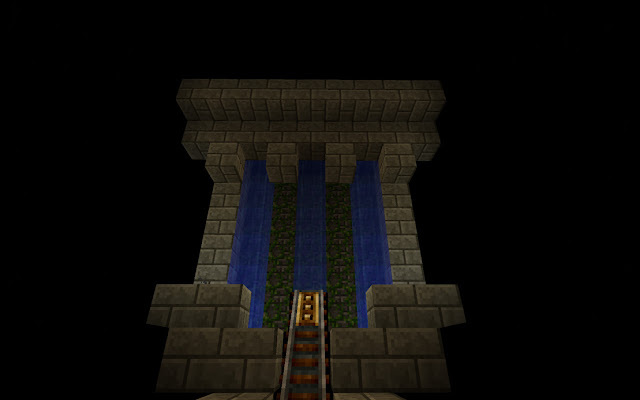 When a cart returns to the top of the dispenser, it triggers the summoning sequence to automagically send another cart to the load platform. The signal light tells you when the automated system is active so for heaven's sake don't push the summon button like a lab rat already. This amazing Quality Of Life feature is brought to you by Mr. D. Spatchel, Esq., who hates remembering which lever position means ON.